Neal Slavin, Frankfurters in Full Dress, 1978, with the recipe: Neal Slavin: Nylen's Frankfurters in Full Dress. Stephen Shore, New York City, New York, September–October 1972, with the recipe: Stephen Shore's Key Lime Pie Supreme. 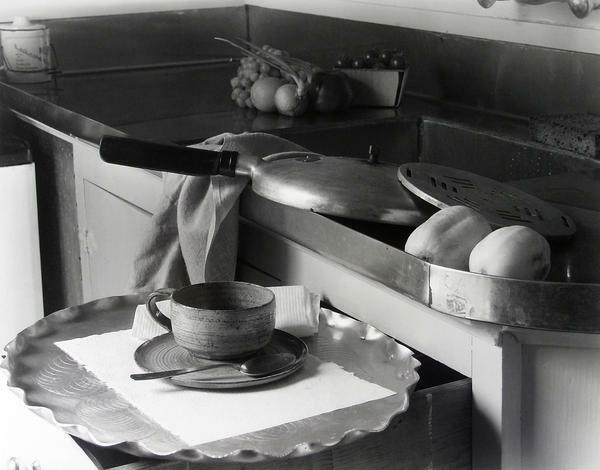 Imogen Cunningham, My Kitchen Sink, 1947, with the recipe: Imogen Cunningham's Borscht. 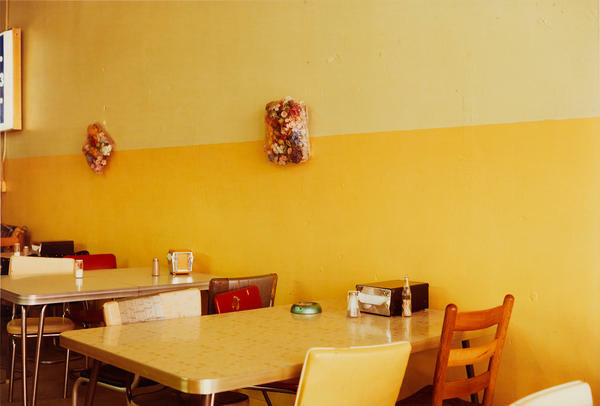 William Eggleston, Untitled, 1976; from the series Election Eve, with the recipe: William Eggleston's Cheese Grits Casserole. 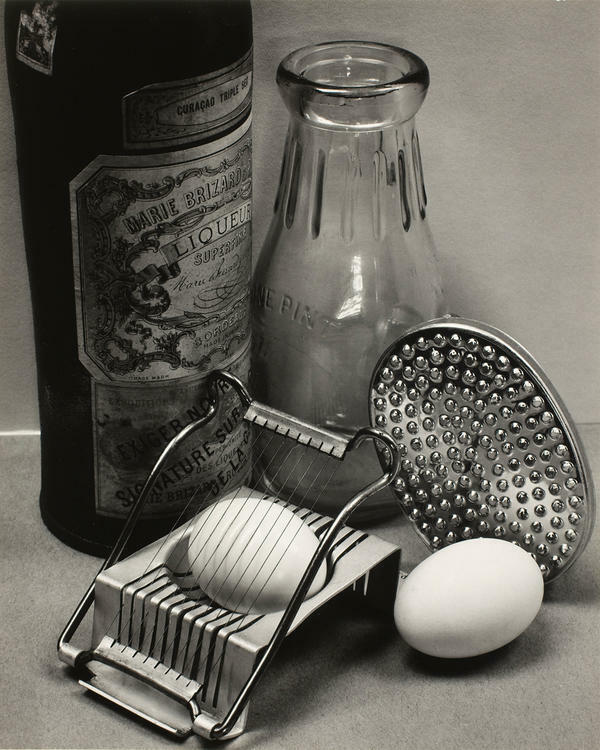 Ansel Adams, Still Life, San Francisco, 1932, with the recipe: Ansel Adams's Poached Eggs in Beer. 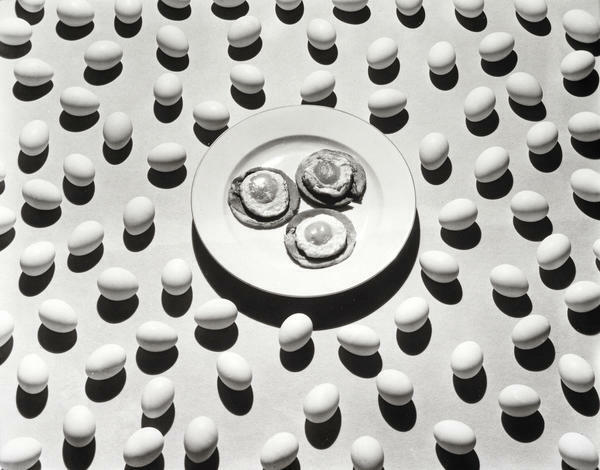 Ralph Steiner, Ham and Eggs, advertisement for The Delineator, 1929, with the recipe: Ralph Steiner's Zwei Vier Minuten Eier. Then, like the projects of so many who leave their jobs for graduate school, the submissions were filed in a box titled "Photographer's Cookbook" and stored away for 35 years. The museum's current curator Lisa Hostetler found the box and brought it to print. The Photographer's Cookbook is a testament to the lost art of recipe writing. Today, thousands of recipes are just a quick Google search away, but there's often very little personality to accompany the bare lists of ingredients and instructions. Then there are the recipes in this book — many of which are not the photographers' dream recipes or even the most impressive items in their culinary arsenals. Portrait photographer Hans Namuth's peasant bread is less a recipe than a praise of the individuality of bread. Rather than giving exact times, he writes that the baker should "let rise until doubled in size. (One hour? Two? It depends on the time of year, the temperature of your house, etc.)" Even the baking temperature itself depends on the oven. He notes, "I have baked bread in many ovens (always preferring gas ovens) and never found two alike." Eileen Cowin writes in the introduction to a recipe for "vegetable cheese casserole" that she once read a Tom Robbins novel that mentioned a spray-on substance that made everything taste like chocolate chip cookies. "That would be my favorite recipe if I could find it. Since I haven't ... " she trails off, before writing down the ingredients for the much more realistic casserole. Ralph Steiner sent in an offbeat recipe for the loftily named "zwei vier minute eier," or "two four-minute eggs." This is not a guy you should ask to cook you breakfast, much less put in a cookbook, yet his recipe speaks volumes about the type of person he was outside of his photography and experimental films. He proudly states that his two greatest culinary accomplishments are "How to take a box of cornflakes down from the shelf" and "How to boil 2 four-minute eggs." He instructs readers to "watch one's watch watchfully for 240 seconds" after dropping the eggs into the hot water. Forget walking a mile in someone's shoes — the best way to get to know someone is to spend a day (not literally) in their stomach. Each photographer chose one photo to go with the recipes, so the recipes themselves are just part of the fun. The photos are subject to artistic license, however. They are often more representative of the photographer's work than of the recipes themselves. Neal Slavin, who specializes in group portraits of everything from bingo clubs to pugs to Miss America contestants, is one of the few who took a photo directly for the cookbook. At first glance, his hot dog recipe is simple. But he then proceeds to give 12 different frankfurter toppings themed to "regional costumes": the New York frankfurter (with sauerkraut); the Southern frankfurter (macaroni and cheese, bacon and even more cheddar cheese); and the Polynesian frankfurter (pineapple rings, cantaloupe and chutney). 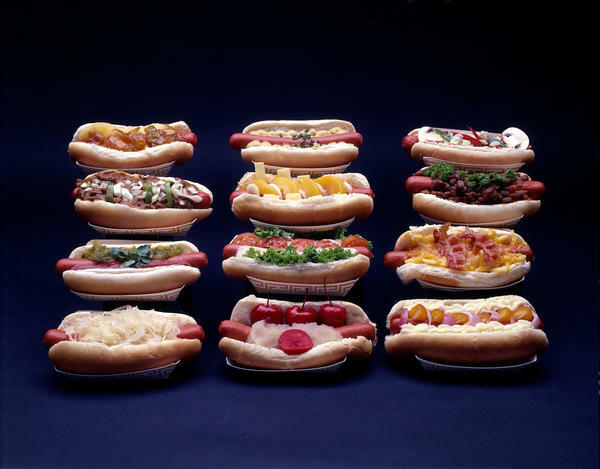 In the photograph, all 12 types of hot dogs are grouped together in their full culinary glory. Some, like Americana photographer Stephen Shore, who many consider the godfather of the type of food diary photography that regularly graces Instagram, chose a photo that has less to do with the recipe and more to do with a jarring juxtaposition of food and art. Despite the sweetness of the food, Shore's recipe for "key lime pie supreme" contains no extra narrative. 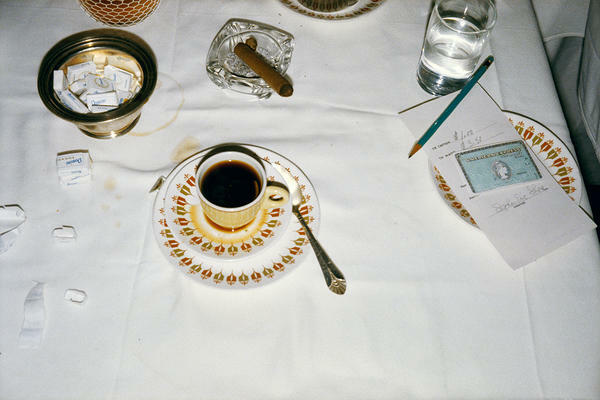 The photo, titled only "New York City, New York", shows the remnants of what looks like a late night — a cup of coffee spilling into its saucer, a stained table cloth, a cigar and the check signed by Shore himself. If this was a night that had a key lime pie in it, the dessert is long gone. The book's introduction notes that cooking and photography — particularly darkroom photography — have similar subjective elements of mixing, experimentation and tweaking. A person's favorite recipe can shed light on who they are, where they come from, how they view life — or whether they'd just like to forget about cooking and eat out. Melt butter in microwave oven, but do not allow to brown. Add a dash of mixed spices and sherry. While eggs are cooking in microwave, make two pieces of toast. Spread part of the butter-spice mix over the toast. Serve eggs on the toast, and pour over the rest of the butter-spice mix. Add a dash of paprika. I like my eggs poached soft. I find that 1 egg in the hot ale or malt takes about 1 minute to cook, 2 eggs about 2 minutes, etc., all the way up to 8 eggs about 8 minutes. When working with as many as 8 eggs, the bowl should be moved around every 2–3 minutes. a. How to take a box of corn flakes down from the shelf. b. How to boil 2 four minute eggs. Eggs are important! You, of course, recall Samuel Butler's famous solution of the ancient question: "Which came first, the chicken or the egg?" He said: "The egg came first: a chicken is only an egg's way of making another egg." One puts water an egg's diameter deep into a pan. Turns heat on. When boiling briskly, drop two eggs in from low altitude. Turn heat off. One watches one's watch watchfully for two hundred and forty seconds. At the stroke of two forty, one removes eggs. On opening eggs I always manage to get some bits of shell—or is it "will" in my eggs. I never know when to use "shell" and when to use "will." Never mind; a bit of shell ingested gives a man shell power. Cook as usual grits in salted water until done. Then add butter, cheese, eggs, and milk. Stir until melted smooth. Place in quart casserole, and bake for 1 hour at 350 degrees. For one thing I do not consider Alice B. Toklas a GREAT cook. Very likely her cooking contributed to the death of Gertrude and herself. Besides her beef stew cooked in burgundy, I can think only of her beautiful soups beginning with gazpacho from everywhere. I do not know how to put it, but exotic eatery is very interesting to me. I think we are all TOO addicted to salt and that we can get enough in vegetables that offer it. We do not know the flavor of anything because we doctor it too much. While I am on soups, I should tell you what I do for borscht. I make a good soup of beef and meat and bones; put some fresh beets in, and when I am ready to serve it, I make it half mine and half Manischewitz (commercial bottle of borscht). I prefer it cold with sour cream. The frankfurter need not be left naked! It can be formalized, decked out, and ethnicized for a sumptuous midnight snack or fun party fare. Condiments, garnishes, and accents can take on any theme. Those described below are "regional costumes" to be grouped buffet style for a party so guests can create their own masterpieces. Bring 6 quarts of water to a boil in one or more large pots. Remove pots from heat, and put in frankfurters. Cover and let stand 7 minutes. Frankfurters can be served right from the pot, or kept warm on a hot tray set on low. They will last several hours in warm water. Buns can be warmed in an electric bun warmer or an improvised version created by placing a basket in an electric frying pan or wok, wrapping buns in a large napkin and covering. Smother frankfurter in relish, and garnish with watercress "clovers." Keep pizza sauce warm on hot tray. Spoon over bun, put in frankfurter, and top with grated cheese, pepper strips, and mushrooms. Put frankfurter in toaster oven to melt cheese. Combine sugar, flour, cornstarch, and salt in a saucepan, and stir in water gradually. Cook on medium heat until thickened. Add the beaten egg yolks gradually and return to a low heat and cook for 2 minutes stirring constantly. Stir in the butter, lime juice, and rind and allow them to cool slightly. Pour into the baked pastry shell and cool.